CHICAGO (FinalCall.com) - The enemies of righteousness have made many forms of evil fair-seeming, while sowing seeds of confusion among God's people through racism, materialism, sexism and ideological differences, the Honorable Minister Louis Farrakhan told a capacity crowd at Mosque Maryam, the international headquarters of the Nation of Islam on October 3. In part three of his monumental lecture series “Who Are the Real Children of Israel?” Minister Farrakhan asked the overflow crowd to look at the divisions of the human family. God is not the author of confusion, he is the author of peace. To the degree that the world does not have peace, it is because there has been worldwide deviation from that way of life that God desires, he said. 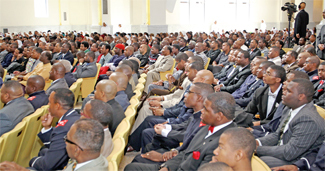 The Minister said he was thankful for God's intervention in America in the person of Master Fard Muhammad, Al-Mahdi, the Self-Guided One who comes to guide a world that has lost its way, and whose appearance is foretold of in Islamic theology. “He (the Mahdi) comes anointed by the Originator to perfect what he originated. He comes with power to crush the wicked who have created a world of evil that is in rebellion to the God of righteousness. He comes to master the day of religion that all the confusion in religion may be settled,” said the Minister. But Muslims, Jews and Christians are all looking for a human being in whom is the holy spirit of God, not a spirit, said the Minister. “The Jewish community does not believe that Jesus of 2,000 years ago was in fact, the Messiah,” he noted. But the long–awaited Messiah of the Christians and the Mahdi of the Muslims has made his appearance in North America and chosen Black people as his people, Min. Farrakhan said. “All of us are under Israel. All of us are under the rule of the Caucasian people and all of the races have been affected by their rule,” said Minister Farrakhan. Min. 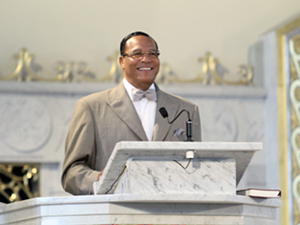 Farrakhan addressed a capacity crowd at Mosque Maryam in Chicago Oct. 3. The Minister delved into the scripture, where it is outlined in the Book of Genesis that Jacob wrestled with an angel through the night. When the morning came, Jacob prevailed, and his name was changed from Jacob to Israel. “Yakub was a scientist who saw in the genetic makeup of the Black man that he could bring out of us a new people, the opposite of the original. That is not evil. That is high science,” said Minister Farrakhan. The enemies of righteousness want to do everything they can to keep the Black man and woman away from the true and proper understanding of their great past and prophetic destiny, and have worked to breed self-hatred into the minds of Black people globally under the power of White supremacy in all systems whether religious, scientific or educational, he continued. Additionally, the research of genetic scientists and anthropologists verify what the Hon. Elijah Muhammad, the patriarch of the Nation of Islam and Min. Farrakhan's teacher, was taught from God dealing with the Original people. The blood of the Black man and woman has been shown to be genetically powerful enough to produce the entire human family, and when attempting to find the origin of Black people, researchers go to Africa, Min. Farrakhan noted. This is not race based teaching in order to exalt one over the other, said the Minister. The White race is styled in scripture under the name Adam, which represents their rule and civilization made in opposition to God, the Minister explained. “Adam was born to rule. He was the God of a new world,” which is why Whites do not like to submit to those they deem to be inferior, especially Blacks, said the Minister. “Barack Obama is a good man, but he is in the hands of the people that planned his ascension to become president of the United States,” said Min. Farrakhan. These wicked forces want to use the president to divert Blacks from their destiny as world rulers and sell Blacks and the Muslim world on the false idea that America has changed, he warned. Muslims respect and honor Jerusalem as Islam's third holiest city behind Mecca and Medina, however Jerusalem, which means “founded in peace” has not known any peace since it was taken over by the modern state of Israel in 1948, Min. Farrakhan said. He also pointed out that the Original Hebrews are Black. Reading from Romans 2:17, he described those who call themselves Jews, but live contrary to the law of God. He also described how Rebekah, the mother of twin brothers Jacob and Esau, through trickery, deceived their father Isaac which allowed Jacob to steal his brother Esau's birthright. Minister Farrakhan explains symbolism of U.S. seal. 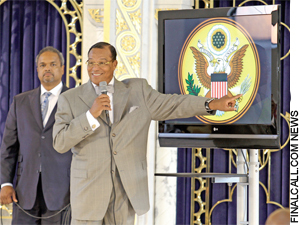 Further outlining the point, Minister Farrakhan used a display screen which showed the seal of the United States of America. The eagle, a bird of prey, holds arrows symbolizing war in one claw, and an olive branch in another claw symbolizing peace on the seal. The nine feathers in the eagle's tail symbolize the Supreme Court justices and in a halo above the eagle are 13 stars, but if the outline of the stars are traced, they form the Star of David, the sign of what is now called Israel, Min. Farrakhan explained. Black people in America are a carcass, the remains of a once great people controlled by Satanic forces, instead of reflecting God, he said. “God had a purpose for the children of Israel and that was to go into a land that had already been carved out for them, but they had to break away from Pharaoh in order that God might fulfill his promise to them, take them through the wilderness into a land of their own,” Min. Farrakhan explained. The spirit and atmosphere was electric and the standing room crowd rose often to its feet and regularly interrupted the enlightening and cogent message with applause. Those who call themselves Jews in these modern times, the European Jews, also referred to as the Ashkenazi Jews, did not fulfill that prophecy, Min. Farrakhan said. Zionism which led to the modern state of Israel in occupied Palestine was a movement for a nation developed in Europe and first considered taking land in the African nation of Uganda before the fledgling United Nation, composed of a few states, sanctioned creation of the state of Israel in the Middle East, he said. But the state of Israel has had no peace and will never have peace based on lying and injustice and using God's name as a shield for unrighteous and unjust deeds, he said. Minister Farrakhan then spoke briefly about his dinner September 20 with the Iranian President Ahmadinejad and 100 Muslim leaders in New York. Minister Farrakhan described how the media deviously portrayed the event as subversive and secretive. Though it was a closed, meeting, there were Muslim leaders from across the U.S. present, and photos were published in The Final Call. It was their own Gentile brothers who targeted the Jews, he said. The Bible's four Gospels are tied to an historic Jesus who spoke in parables and was a sign of a Christ-figure in the last days of White rule—not the Jesus who fulfills prophecy today, the Minister said. The Holy Qur'an presents a picture of the angels revealing to Mary that she would have a child that would be the Messiah. Messiah is a function, not a name. He—the Messiah—would speak to the people in the cradle, and at old age. Scriptures say God will “teach him The Book and The Wisdom and The Torah and The Gospel,” Minister Farrakhan said. The Islamic scripture also says God “will make him a messenger to Children of Israel,” he added. After the appearance of the Messiah, the Jews began to plan his death, and so it is today, with those who desire to “with ingenuity and skill” to make Black people ungrateful and rejecters of their own salvation, the Minister warned. Obedience to that message will mean Blacks rising to world rulership by God's permission and ushering in His kingdom, the Minister said.